Imagine Buying and Investment differences. "We are buying a property", normally the intention of owning it. "We are investing in property", normally the intention to sell it for the Return of Investment. The return of investment in property, basically take years, however knowing the low price and the target acceptable market price, it would be a short term selling it off which is able to absorb the tax value and loan interest. The tips is how to create value for that particular properties and what are the key factors for the properties to fetch a high price? Just imagine, one property for 5 years investment, how many 5 years do we have? In other words, people would probably take 1 property for each year, therefore within 5 years, they have 5 properties. After that, each properties plan to be sold for the 6th year, 7th year, 8th year, 9th year and 10th year. And each year would replace with another property. Have you played MONOPOLY games? a) receive rental fees monthly. Yeap, monthly is the timeframe, value is the return of investment. b) selling off properties yearly. Yeap, yearly is the timeframe, selling value is the return of investment. Well, planning to sell it off with a higher price, within a timeframe, would consider return of investment. However without timeframe concept, we probably means keeping it for the times we need the money. How the price is going up, and how the price is going down, and what factor contribute this fluctuation of the share prices? Therefore, getting a properties without selling it means buying that property. Getting a share without knowing when and how, it means keeping it until the time to desperate to sell, most probably when share price is going down. Therefore, study carefully, plan a system, study what Investment works best for you. 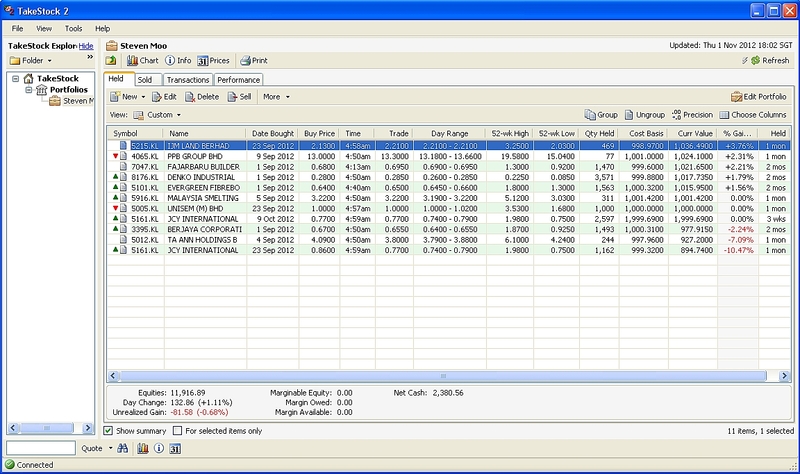 Below is a tool, to capture market price, and the timeframe and percentage of return. TAKESTOCK2. 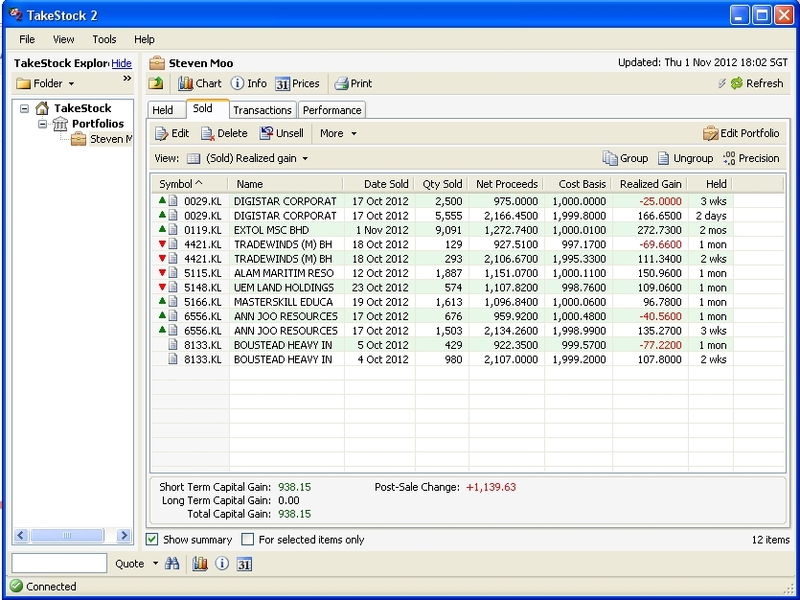 At the sold page, the "HELD" column is displayed. Just imagine in order to get 10% of investment, it probably take weeks or months to complete. If 10% is RM100, or RM1000, does the return of investment should be faster than property? Therefore, timeframe, % value of return of investment, what kind of factor, should be at your finger tips, learning how winning shares should more than losses shares. Start practise without spending any money yet.